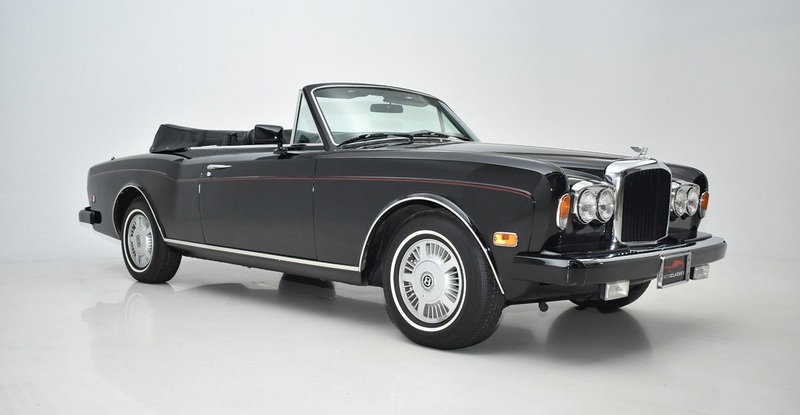 Classic car enthusiasts who are searching for an exceptional vehicle from yesteryear will want to take a closer look at what the 1987 Bentley Continental offers. Bentley is a luxury automotive brand that has established an amazing reputation for impressively combining luxury and class with unparalleled performance on the road. Over its century-long history, the automaker has created numerous models that have competed in and won the popular 24 Hours of Le Mans auto race. When you learn more about the automaker, you will find that the brand's ownership has changed hands several times, and the 1987 Continental was produced under Vickers ownership. It was notably designed and manufactured at a time when the brand's reputation for performance was waning, and the Continental was designed to impress drivers and to restore the brand's reputation for delivering superior performance on the road. With a visit to Champion Motors International serving New York New Jersey, you can get a closer look at all that the 1987 model year offers, and you can even get behind the wheel to experience its undeniable performance capabilities for yourself. Over the last century, Bentley has created many truly sophisticated vehicles with standout exterior styles, and the Continental is included in this distinguished group. The 1987 Bentley Continental is available only in a two-door design, and the two body design options are a sports coupe and a convertible. Your used Bentley Continental for 1987 has several distinctive characteristics that make it easy to identify on the road. These features include a rectangular, black grille that is impressively outlined with thick chrome molding. To the sides of this identifiable grille, you will find a rounded dual-headlight design, and these lights are also outlined in chrome. Bentley's logo adorns the top of the grille at the end of the hood. You will notice that the hood is elongated and has stunning undulations. The more notable undulations include pronounced curvature over the headlights. When you admire the 1987 Bentley Continental in New York from the side, you will notice that the profile begins with stout thickness at the front end, and it fades linearly toward the rear of the vehicle to create an athletic, bold look without sacrificing the sophistication of the design. You may expect a used Bentley Continental coupe or convertible to have a compact interior, but you may be surprised to discover that the cabin is roomy enough to accommodate five passengers. The 1987 model year may be more than 30 years old now, but it was so well-appointed originally that it continues to pamper drivers even today. Your used Bentley Continental will be outfitted in durable, comfortable leather. Original interior color options for the Continental include white, black and tan. The interior has the classic look of an older model, but it also has numerous upgraded features in line with the era. The interior features include adjustable front seats, power door locks, climate control, an audio system, storage spaces in the doors, faux wood trim, iconic instrumentation gauges, interior lighting and more. When you stop by Champion Motors International serving New York New Jersey, you can admire the undeniable style and exceptional features of this popular luxury car in person. When you get behind the wheel of a vehicle that has a solid heritage of performance on the road, you understandably expect great things. The 1987 Bentley Continental will not disappoint drivers who are looking for an amazing driving experience. Because of the car's luxurious features and style, it is a very heavy vehicle. However, its fuel-injected, OHV V8 engine lives up to the challenge of providing you with a great driving experience despite the eight of the Continental. In fact, it can reach a speed of 60 miles per hour within ten seconds. It can also reach a high speed of 120 miles per hour. In addition to having amazing power from a well-designed engine, itcomes with exceptional stability and traction control features, a self-leveling suspension, power disc brakes and other features to ensure that you enjoy your time behind the wheel. This is a vehicle that you should plan to test drive soon at our dealership serving New York New Jersey in order to experience its full capabilities on the road. This is an automotive brand that is commonly associated with superior luxury and impressive performance, but safety is not a matter that the automaker takes lightly. In fact, it has a long history of regularly updating its models' safety features as new innovations become available. As you review the safety features in the 1987 Bentley Continental in New York, you will notice that it has many standard safety features. These include adjustable headrests on the front seats, thick padding on the dashboard and throughout the interior, superior braking features, a durable body frame, a steering wheel with an energy-absorbing column and other features. Through a visit to Champion Motors International, you can get to know more about the 1987 Continental coupe and convertible options. Remember that this is only one of our many classic and luxury vehicles. We invite you to visit us personally to learn more about our diverse inventory. You can rely on our helpful and knowledgeable automotive experts to help you make an informed vehicle buying decision. Call us today to make an appointment with one of our representatives.